Cover illustration: Christ as the Man of Sorrows. Medieval painting showing through the later painted black-letter text from Cramner's Bible of 1539. Reproduced courtesy of The Priory Church of St Mary and the Holy Cross, Binham, Norfolk, England. Photograph by Ronald A Chapman. There is no bloodless myth will hold. In No Bloodless Myth (I am once again indebted for a title to Geoffrey Hill), I continue the exploration of Balthasar's great trilogy by considering his sustained (five volume) meditation on the relation between Christianity and the theatre - seen not for its own sake, fascinating though the subject is, but as a parable for the drama of redemption itself. Other writers this century had spotted the theological suggestiveness of drama as an art form. But no one has exploited the rich veins of ore to be found there on this colossal - industrial! - scale. Theo-Drama is a wonderfully rich and rewarding work. And once again, my aim is to render it more productive for the Church by providing the reader with a guide which will let them see the wood in the trees. A word on translation. The Anglophone public is fortunate to have Theodramatik in a translation which is, frankly, a masterpiece. Graham Harrison's English version of the final volume only became available when I had finished this work. I have substituted his translations for my own in the great majority of cases. Where, occasionally, I have preferred my version, the page references to the Ignatius Press edition are given also. 1. H. U. von Balthasar, Theodramatik (Einsiedeln 1973-1983). 2. Idem., Theo-Drama: Theological Dramatic Theory (San Francisco 1988-1998). 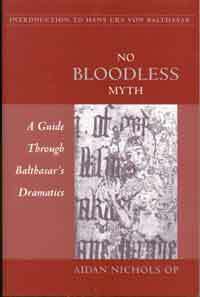 Extracts from "No Bloodless Myth" reproduced with the kind permission of the publisher.